Sahoo, S., Patwari K, P., Kumar C.B, M., Setty, C. (2013). Synthesis and Biological Activity of Certain Mannich Bases Derivatives from 1, 2, 4-Triazoles. Iranian Journal of Pharmaceutical Sciences, 9(4), 51-60. Subhas Sahoo; Pranesh Patwari K; Mahendra Kumar C.B; C.Maliikarjuna Setty. "Synthesis and Biological Activity of Certain Mannich Bases Derivatives from 1, 2, 4-Triazoles". 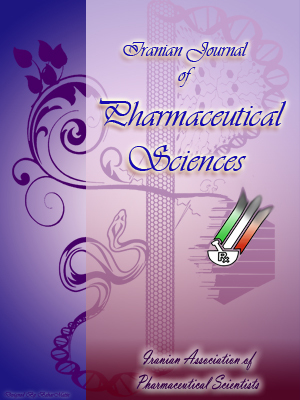 Iranian Journal of Pharmaceutical Sciences, 9, 4, 2013, 51-60. Sahoo, S., Patwari K, P., Kumar C.B, M., Setty, C. (2013). 'Synthesis and Biological Activity of Certain Mannich Bases Derivatives from 1, 2, 4-Triazoles', Iranian Journal of Pharmaceutical Sciences, 9(4), pp. 51-60. Sahoo, S., Patwari K, P., Kumar C.B, M., Setty, C. Synthesis and Biological Activity of Certain Mannich Bases Derivatives from 1, 2, 4-Triazoles. Iranian Journal of Pharmaceutical Sciences, 2013; 9(4): 51-60. 4Department of Pharmaceutics, Oxford College of Pharmacy. Banglaore, India. Substituted 1, 2, 4- Triazoles have shown multiple biological activities such as anti-inflammatory, anti fungal, etc. 5-mercapto triazoles were prepared from the potassium dithiocarbazinates. These triazoles were used for preparation of different derivatives by two different schemes. In the first scheme the Mannich bases were prepared from 5- marcapto-s triazole Quinazolines. The 5-Marcato-s-Triazole Quinazolines were synthesized from 5-Marcapto-s-Trizole by reacting with the Quinazoline benzoic acid or acid chlorides. In the second scheme, the synthesis of Quinazolyl Triazolo Thiadiazole Derivatives were prepared by the reaction of Quinazoline benzoic acid and 5-Marcapto-s –Triazoles in POCl3.All the newly synthesized compound structures were elucidated using various spectral techniques viz. IR, 1HNMR and screened for in vitro antibacterial and anti fungal activities. Anti bacterial activity was carried out against organisms Bacillus pumilus, Bacillus subtilis, Staphylococcus aureus, and Escherichia coli as well as anti fungal activity were carried out against A.Nigier and C.Albicans. The results substantiated that the synthesized compounds were effective against bacteria, fungi.